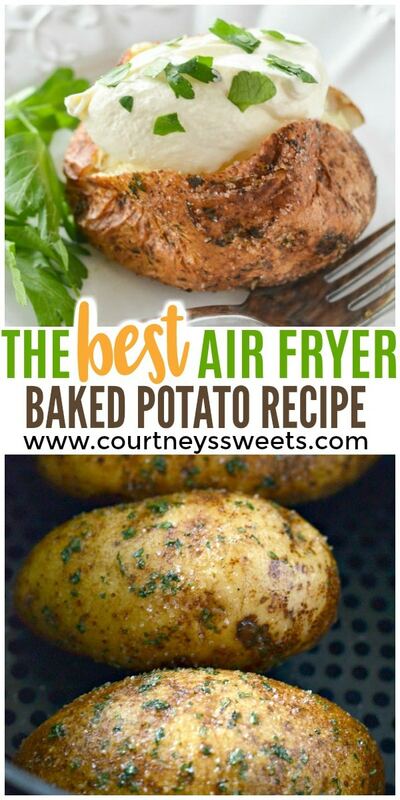 We have many rave reviews from so many readers how this is the best air fryer recipe and baked potato recipe they’ve ever made. 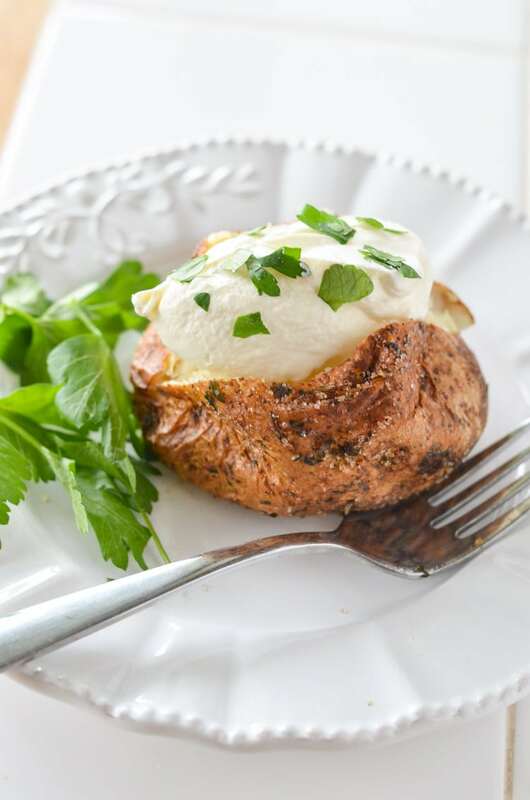 Our air fryer baked potatoes are a well-loved recipe, one of our favorite ways to use our air fryer and definitely one of our favorite air fryer recipes! We’re the original creator of the seasoned baked potato. No one can resist our recipe for parsley potatoes with garlic! First, start by making the seasoned potatoes. Cover the potatoes in the parsley garlic salt rub. This is how they look right before I drizzle a little bit of oil onto them. The bottom pan of the air fryer will catch any drippings. The oil helps the skin crisp up and makes all of the seasoning stick to the potato skin as well. This potato skin tastes so delicious. It makes for a perfectly seasoned potato. Once they have the oil on them they’re ready for the air fryer. You can just put them right in and fry in the air fryer at 392 degrees for 35-40 minutes. The cooking time depends on small or big the potatoes are. The bigger they are the more time they will take to cook. We place them right into the basket. You do not have to cover baked potatoes with foil in the air fryer, you just place them in the basket to cook. Once they come out of the air fryer you can slit the potato and pinch and push both sides to open the potato. We like to top our potato we go with a dollop of Greek yogurt, but you could also use sour cream. Don’t like either of those? We also put butter or even melt mozzarella onto them. Kids even like them with a little ketchup. 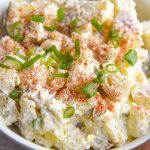 What to serve with air fryer baked potatoes? Baked potatoes are great with a lean protein like oven baked chicken or air fryer pork chops. Want something a little more fancy? Try our air fryer bacon wrapped filet mignon. If you want really crispy stuff without frying this air fryer is excellent! Fries are crispy, our potatoes are crispy on the outside and perfectly fluffy on the inside. This is NOT a deep fryer. Think of it more like a convection oven. You can even bake in your air fryer! 🙂 At first, I used it thinking I could fry anything that I would typically fry like zeppoles. In all honesty, I didn’t like it because I was approaching it the wrong way. I was trying to make deep fried desserts, and the Air Fryer isn’t made to do that. It helps to make some fried foods that you’d usually enjoy a much healthier option by using an air oven. 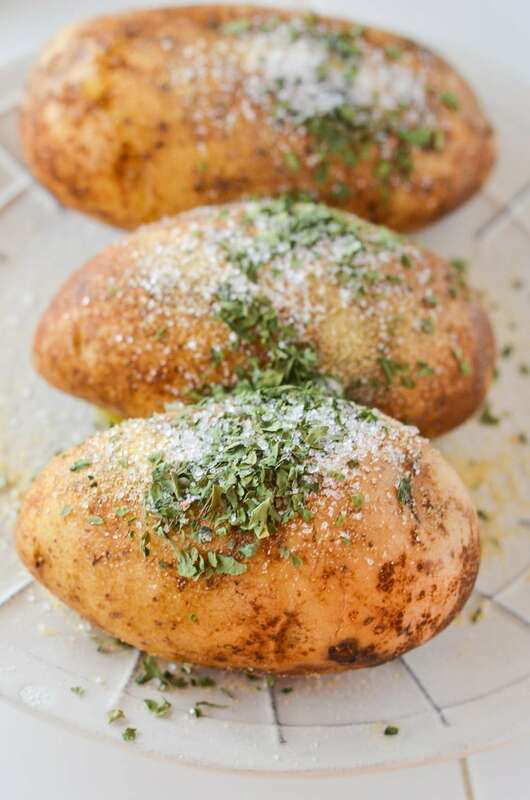 You can cook without any add oil, and it’s oil free cooking unless you’re making our Air Fryer Baked Potatoes with Parsley Salt, and Garlic! The oil helps the potatoes get that beautiful crispy skin. Who doesn’t love a crispy baked potato on the outside and feather light cooked inside?! Ohh and that salted garlic crust is INSANE!! Every potato will be gobbled up as soon as they hit the plate. Once I realized it wasn’t a typical fryer and I couldn’t do batters a whole new world opened up! I made delicious baked potatoes. In only 35 minutes! Bigger potatoes may take a bit longer and smaller potatoes will cook up quicker. Why not just make a microwave baked potato? You will not get a crispy skin in the microwave. Microwaves result in more of a gluey potato, cookout essential nutrients, and just won’t pack as much flavor as our air fryer baked potatoes. We hope you love your air fryer and your air fryer baked potato! If you have any questions or suggestions for more air fryer recipes let us know in the comments below! Air Fryer Baked Potato covered with a parsley garlic salt rub. 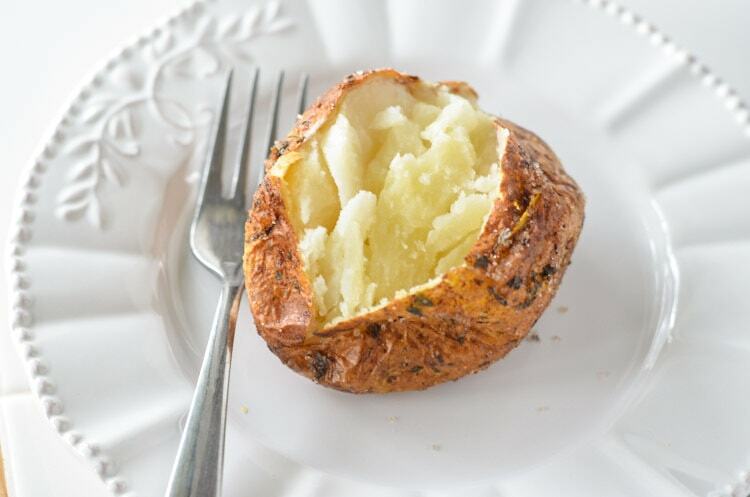 Making Air Fryer Baked Potatoes will be your new favorite way to use your air fryer. Wash your potatoes and then create air holes with a fork in the potatoes. Sprinkle them with the olive oil & seasonings, then rub the seasoning evenly on the potatoes. Once the potatoes are coated place them into the basket for the Air Fryer and place into the machine. Cook your potatoes at 392 degrees for 35-40 minutes or until fork tender. Top with your favorites. We love fresh parsley and sour cream! The nutrition is always estimated and with this recipe, it counts the full amount used. That means when you get salt on your hands, salt in the bowl and seasoning drops into the air fryer basket, it is still counted towards the nutrition label even though it's not in the recipe. If salt intake is a concern we suggest using it at the end to season with your desired/allowed amount. These are perfect for your next cookout or even alongside dinner. We make them at least once a week, either air fryer baked potato or air fryer baked sweet potato. 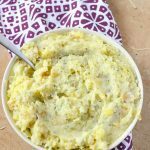 When the whole family loves and enjoys something we tend to make it often and this air fryer baked potato recipe is a staple in our home. 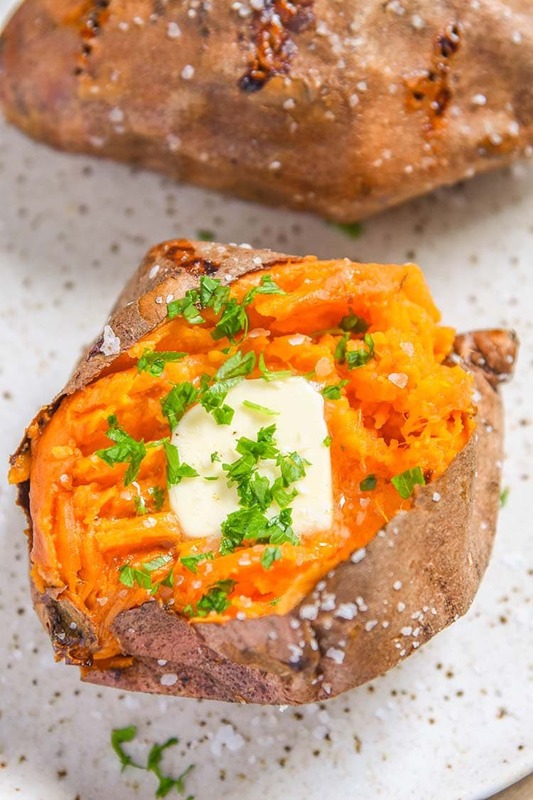 Our air fryer sweet potatoes are a must try. It’s just as good as our air fryer baked potato but sweeter. We are baked potato connisouers in my house. my daughter even shot a video on how to make the perfect baked potato at home when she was 8, lol! I can tell by your photos you achieved that perfect light and fluffy interior! That shot of the potatoes….gorgeous! This looks so delicious. Mouth watering. And again, I want a baked potato now. Time to run to the store! I love your video! I will have to use my air fryer for potatoes. I am LOVING the idea of the garlic ON the potato. I will be making this this week! THOSE POTATOES LOOK AMAZING!!!! I NEED THAT NOW!!! 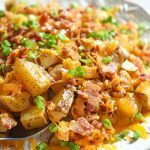 I love baked potatoes and this makes a lunchtime potato so much easier. I’ve never heard of an air fryer before. That potato looks like it was baked right in the oven. Yum! 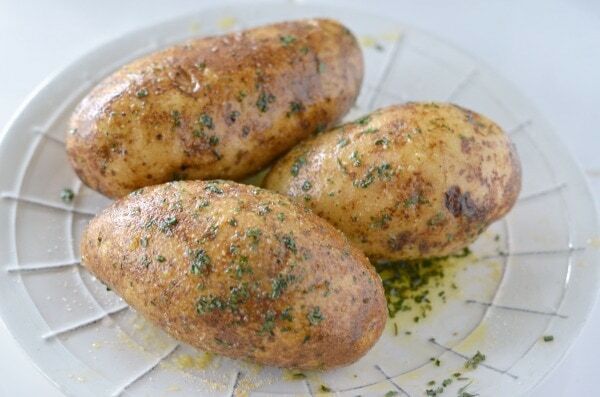 I love baked potatoes with garlic! But I love sweet potatoes even more! It would be great to fry something and have it still be healthy. I would try these baked potato. I would love to try one. I was scared to buy one because I didn.t understand how they work. I have been craving a good baked potato! This looks awesome! I adore baked potatoes so definitely plenty of those! I definitely have to get my hands on an air fryer.. 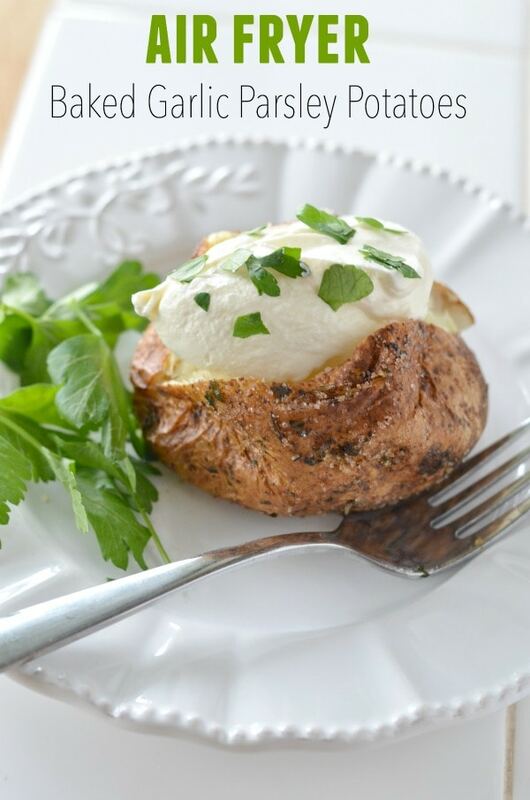 I just love everything about these delicious garlic and parsley air fryer baked potatoes too! This air fryer baked potato was a hit, oh yeah! I would use it for sweet potatoes, plantains, zucchini and maybe avocados? I’ve seen avocado fries before! 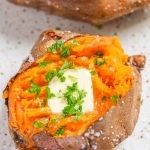 I love this and would make baked potatoes and sweet potato fries as well as fried fish! Oh wow this seems so cool! A healthier alternative to frying! 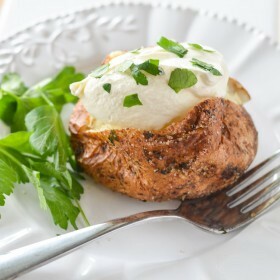 My kids love when I make baked potatoes, this is a recipe is dynamite, so much flavor! Looks soooo good. I love potatoes and this well satisfy my appetite anytime! I can not wait to make these!!! 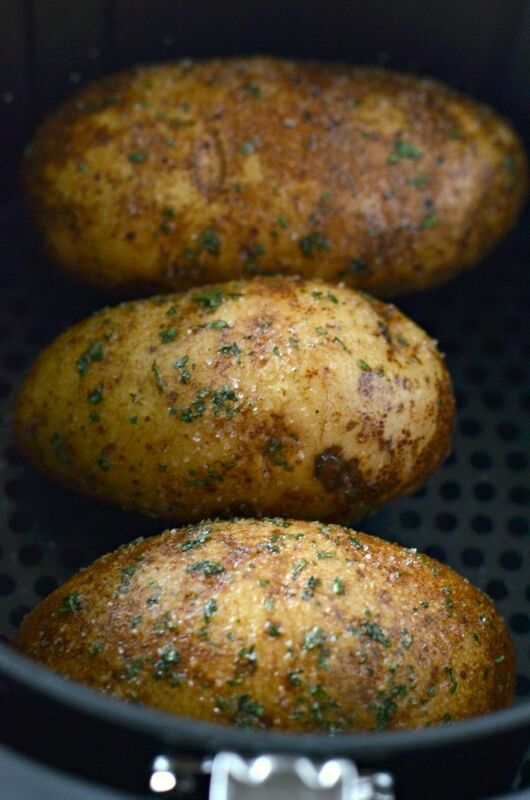 Those air fryer baked potatoes look amazing! Great alternative to frying. 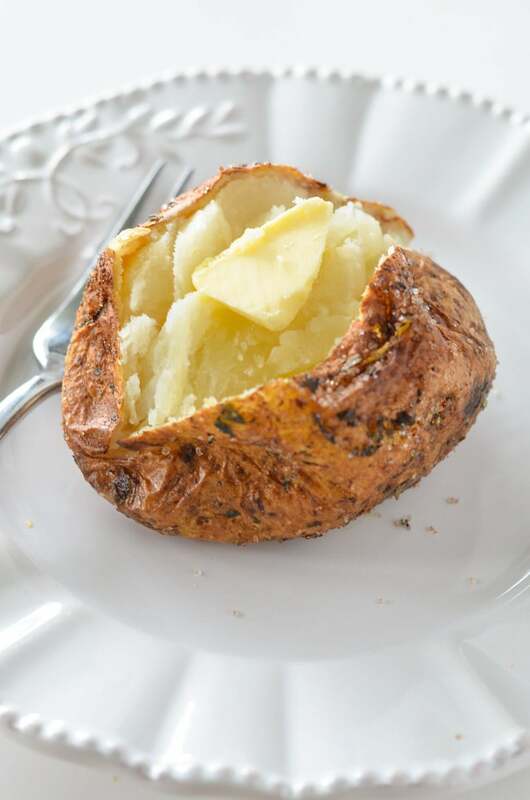 Can’t wait to try this air fryer baked potato recipe! Great recipe. This is the best air fryer baked potato I have ever made! This is such a great idea for the whole 30 that I am on. Great idea. 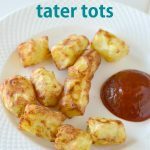 These look amazing but how long would I cook the mini potatoes for? They are about quarter sized. Looks good.. I have a power air fryer… I like how you wiped your hands on your dress, lol…. Thanks for the sweet comment, Kenani! Courtney, I just made these – delish!! Thank you for the Recipe. Question: is the sodium content correct 2336 mg?? Hi Madi! Glad you enjoyed 🙂 I’ve updated the nutrition label with a note to follow up on your concerns about the salt. 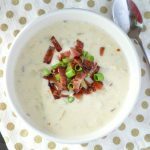 As you know from making the recipe the seasonings will get all over your hands, the bowl, and even some ends up in the bottom of the air fryer. 😮 Unfortunately, the recipe card counts the total amount used, but we really don’t use all of that salt. If salt is a concern you can always add salt at the end or the desired amount in the beginning. Just bought my first air fryer. Will a single potato take the same amount of time as two or three? Your recipe looks delicious! Thanks. I just bought an air fryer a few days ago. I’ve not yet used it because I’m just deathly afraid to!!! I’m a “traditional cook” with many years in the kitchen, so trying new gadgets is tough for me. As I’m watching my 60-year-old waistline, though (what’s left of it, anyway!😉), I thought it might be wise to get on board with the air fryer everyone’s ravaging about. This baked potato seems like a good, safe kickoff recipe. If I screw it up, I’m only out the cost of a potato! Thanks for dragging my toe into the water! The air fryer is a healthy alternative to cooking in oil, but the sodium is over 2200. Why so high? Is there a way to get the sodium lower? If I wanted to wait 45 minutes for a Baked Potato, I would use the Oven. I’m going to trying microwaving it for a few minutes & then crisping it up in the Air Fryer.